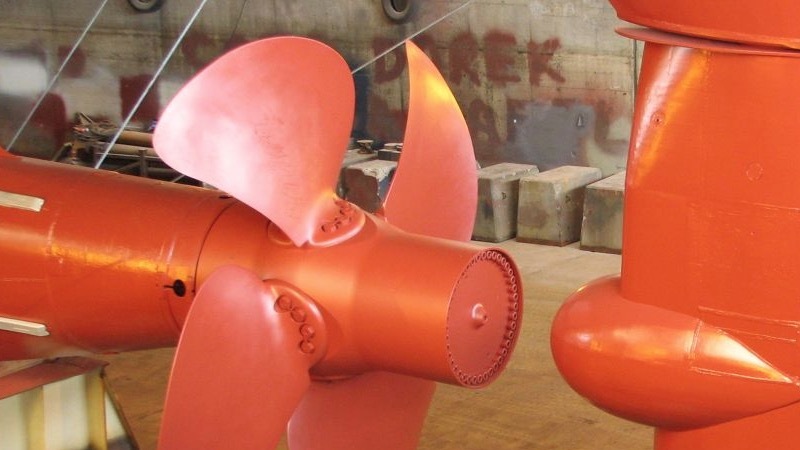 Damage to rudders, running gear and the stern areas of ships due to cavitation is a perennial problem for shipowners, operators and managers, resulting in damaged protective coatings, erosion of surfaces, and ultimately, corrosion. Belgian company Subsea Industries, however, claims it has the answer with its Ecoshield coating. Following successful flow channel tests undertaken at Grenoble by the French Ministry of Defence, it was demonstrated that the hard-type coating offers a higher degree of protection, even under severe cavitation. The tests were undertaken in six stages, during which Ecoshield was exposed to increasing pressure drops, creating a growing cavitation force. Even after all stages, the test patch showed no erosion. “Cavitation on rudders can result in conditions being imposed by class, which can impact sailing schedules by preventing access to certain ports or requiring more frequent dockings and additional costs,” said Manuel Hof, Production Executive of Subsea Industries. “No shipowner wants to go to drydock unless it’s absolutely necessary, and certainly not before the usual five-year interval has passed. And even at standard docking intervals, repairs to cavitation can involve extra time because of the close proximity of rudders, propellers and surrounding stern areas, necessitating special procedures for blasting, welding and painting work. “Subsea Industries’ Ecoshield coating has been developed especially for areas that are subject to cavitation. It is a specially reinforced version of the company’s well-proven Ecospeed, offering similar advantages, but with even greater strength. “Designed to be applied over areas that are subject to high stress levels, it cannot prevent cavitation occurring, but resists damage to the coating thanks to its unique combination of impenetrability with sufficient flexibility to absorb cavitation forces. If cavitation cannot pierce the coating, no corrosive damage can occur,” furthered Hof. According to the manufacturer, Ecoshield avoids additional drydocking problems as it is designed to remain intact for the lifetime of the vessel and is guaranteed for ten years. No repainting of running gear will normally be needed during drydocking, normally only light touch-ups to less than 1% of the surface area will be needed. A further benefit is that the ease and flexibility of application make Ecoshield suitable for application at any stage in the docking process, rather than the docking schedule having to be arranged or extended to suit the coating system. With a minimum overcoating time of three hours, the required two coats can be applied to areas such as rudders, propellers or thruster tunnels in a single day. Recently, Ecoshield has been applied to the rudders and bow thruster tunnels at yards in China, Singapore, Japan, Estonia, Turkey, Denmark and Germany. It is now protecting vessel types including container ships, vehicle carriers and ferries for the remainder of their service lives.